ACUTE PROSTATITIS is inflammation of the prostate gland. It is very common in men under the age of 50 and sometimes in men in their 30s and 40s. 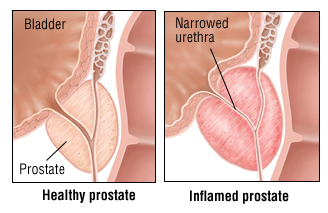 A small percentage of causes of acute prostatitis are related to an infection of the prostate. You will know if your prostate is infected because you will have pain in the pelvis and your genital area. You are also likely to be suffering from a high temperature with fever and chills and a burning sensation when urinating. Visit your doctor urgently it can be life threatening. Reflexology cannot help with an infected prostate. CHRONIC PROSTATITIS is not related to bacteria or infection and is often a chronic problem causing enlargement of the prostate. The reasons for the development of chronic Prostatitis are unknown. It is known that stress often makes the symptoms worse and illnesses that affect the immune system are likely to enhance the condition. As men age the prostate gland often increases in size and men over the age of 60 find that they have problems with urinary urgency and frequent urination. Sometimes the urine stream becomes weak or dribbles. They may also find that they have other problems related to their sexual function. If your doctor advises that you do not have prostate cancer then you may want to find a way to improve the health of your prostate with reflexology which is a prostatitis treatment. It is vital that men look after their prostate and a foot reflexology treatment assists with this. In one reflexology treatment I can show you how to work on your feet to keep your prostate gland healthy. ​My interest in Men’s prostate health began after I lost my husband to Prostate Cancer two years after he had been diagnosed with the disease. My husband’s treatment regime was debilitating and he suffered from both incontinence and erectile dysfunction and this affected his self esteem. Following his death I commenced reflexology training and I decided to conduct research into Prostate Cancer and the various treatments used to slow or stop the progress of cancer following diagnosis. I discovered that in spite of much of the good work currently conducted in saving lives the result of the treatment is often loss of continence and erection function, temporarily or permanently. I researched the benefits of reflexology for the conditions worldwide and discovered a study performed by the Bauneholm School of Reflexology in Denmark on forty six participants with prostate enlargement (prostatitis). The participants received eight reflexology treatments on the feet. I am currently using reflexology therapy on men who have had radiation treatment or a prostatectomy following the diagnosis of Prostate Cancer.